A friend of mine, who has followed my work in reincarnation research, brought to my attention the musical performance of a teenage pizza delivery guy named Bryce Dudal, who, after delivering a pizza to a family who owns a baby grand piano, performed a flawless performance of a composition by Ludwig Von Beethoven. A video of this performance was posted on social media, which led to Bryce Dudal being featured on an episode of the Ellen DeGeneres Show. 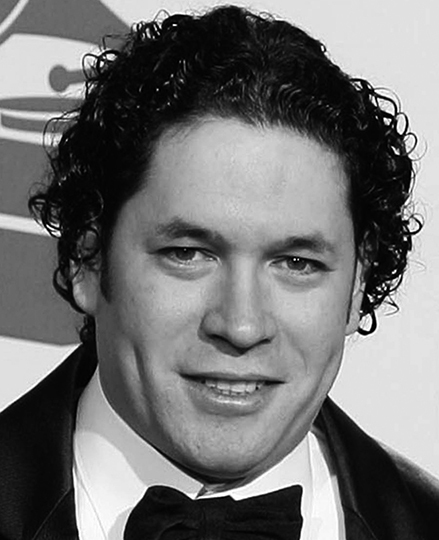 In comments made on social media regarding this DeGeneres episode, people noted that not only did Bryce Dudal perform Beethoven passionately, they noted that Bryce has an uncanny physical resemblance to Ludvig Van Beethoven. As part of the Ellen DeGeneres show, Bryce Dudal was gifted a Yamaha piano. Bryce told Ellen that his dream is to play piano, particularly the compositions of Ludwig Von Beethoven, to audiences around the world. In a session that I had with Kevin Ryerson, who channels a spirit guide named Ahtun Re who has demonstrated the ability to make past life matches with a high degree of accuracy, it was confirmed that Bryce Dudal is an incarnation of Ludwig Von Beethoven. Of interest, I posted another incarnation of Beethoven years ago, in which the conductor of the Los Angeles Philharmonic Orchestra, Gustavo Dudame, was also identified as a reincarnation of Beethoven. An image of Dudame in a tuxedo is provided to the right. Facial features of Beethoven, Gustavo Dudame and Bryce Dudal are consistent. Click on images to enlarge them. The reincarnation cases involving Bryce and Gustavo represent cases of Split Incarnation, in which a soul can animate two bodies at a time. Ian Stevenson, MD of the University of Virginia also documented Split Incarnation cases. Stevenson termed these as “Cases with Anomalous Dates,” as lifetimes in these cases overlapped in time. Physical Resemblance in Reincarnation Cases: The facial features of Ludwig Von Beethoven, Bryce Dudal and Gustavo Dudame are consistent. 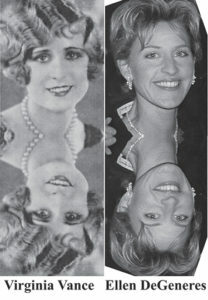 Ellen DeGeneres also has the same facial features as Virginia Vance. Click on images to enlarge them. Past Life Talent and Reincarnation Prodigies: The musical talent of Ludwig Von Beethoven appears in the lives of Bryce Dudal and Gustavo Dudame. 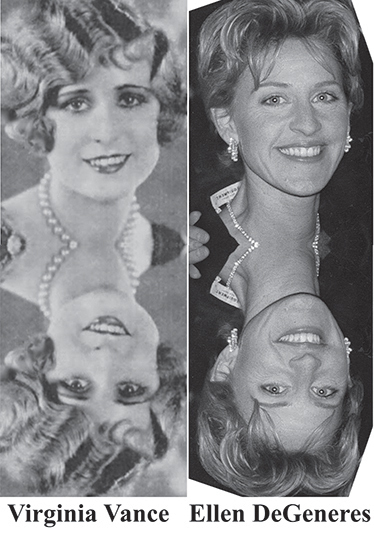 The comedic abilities of Virginia Vance are observed in the career of Ellen DeGeneres. 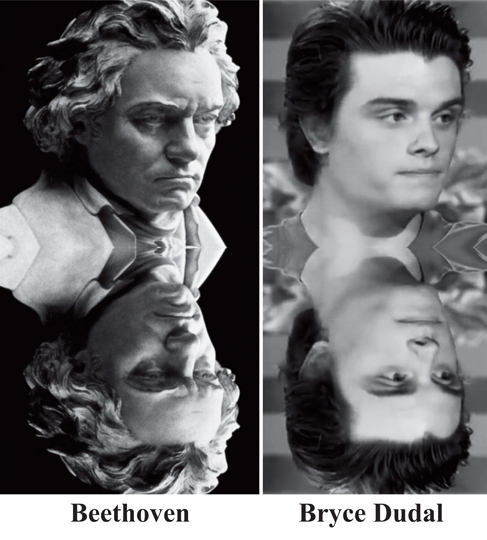 Split Incarnation or Parallel Lives: Beethoven has reincarnated in the personas of Bryce Dudal and Gustavo Dudame, who are incarnate at the same time. Change of Nationality and Ethnic Affiliation: Beethoven was born in Germany, while Bryce Dudal was born in the United States and Gustavo Dudame was born in Venezuela.